I'm not blown away by the fact that someone in the NFL decided "one week after the Super Bowl" was enough time to wait to sign someone who should've been blackballed from the league last November. I just wish that the league's decision-makers could be forthright and honest with their paying customers, just once before the sun explodes. #Browns GM John Dorsey on the Kareem Hunt signing: “By means is this a guarantee of anything.” Dorsey explains Hunt as being extremely remorseful for actions described as “egregious. He understands the act he’s committed." ​​"He understands the act he's committed. But he still committed it. Which we're fine with." From what I've been able to gather thus far, Kareem Hunt realized he was incredibly sorry for combatively kicking a woman on the floor of a Cleveland hotel hallway the very second it became evident that such an action, when recorded on tape, could extricate him from his chosen profession. ​Hunt signed with the Browns because he's a supremely talented running back and he's 23 years old. He did not sign with the Browns because his blood samples presented off-the-charts levels of remorse and decision-making acumen, acquired in the past four months. Which brings us to ​Colin Kaepernick, the clearest victim of collusion outside the ​MLB free agent pool. And if you're tired of this argument, then congratulations: you might want to take some time to listen to his message. Because no one's a better example of "understanding the act he's committed" than Kaepernick, and said understanding hasn't gotten him any closer to an ​NFL field. In Kareem Hunt’s statement, he says he understands “I have to earn my way back to the NFL.” Most experts do not advocate for zero tolerance. But the Browns signing Hunt now, just a few months after he was cut & began counseling, doesn’t seem to line up with earning his way back. 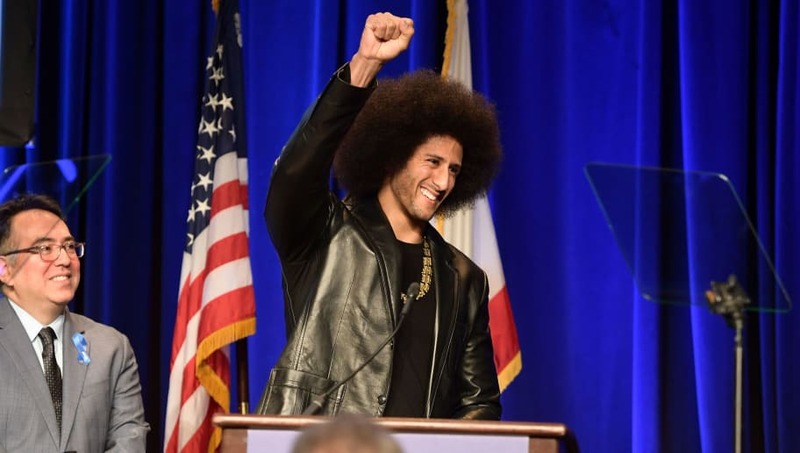 ​​In no uncertain terms, Kaepernick was a fringe-level NFL starting QB at the time of his departure, lost in a mess of tattered 49ers former greatness. If there had been no extenuating circumstances, he'd have been viewed as a perfect bounce-back candidate elsewhere, only four years removed from making the Super Bowl as a rookie and nearly sending Mike McCarthy permanently to the showers (if only!). Instead, he chose to take a knee on the biggest stage he could find to peacefully, yet forcefully, protest the race-based police brutality that still permeates our culture. Nothing Kaepernick silently said was meant to slight anyone else. Of course, all lives matter, but when you say that, you're distracting from the lives in danger which we were specifically intending to discuss. The league shut down that conversation, bending the knee to President Trump on a grand scale, and shuffled Kaepernick out of the league in favor of Mark Sanchez, Josh Johnson, Garrett Gilbert, and hundreds of other Madden create-a-players on their seventh or eighth chance. Trump, of course, responded by screaming about 48 different other things, blinking and forgetting that the NFL was even talking to him in the first place. The Browns have signed Kareem Hunt, and GM John Dorsey explains why. Kaepernick's had 12 times the length of time Hunt's had to "think about what he's done," and his message has only grown stronger. But the fact remains that he should be in the NFL right now, either trying to figure things out as a backup, or starring on a second chance opportunity. Right now, the league is prioritizing menacing talent over stars with a message. And I at least wish they would tell me point blank that they don't care about anyone learning a lesson if the man with the greatest lesson to teach remains barred from the sidelines.